Join me for the ultimate night in. Enjoy a nice glass of wine and conversation. Then when you name comes up step in the spa room for a relaxing and refreshing express hydro-facial. After your express facial step back out and enjoy the fun. Hydro-facial or hydrodermabrasion uses water and a combination of serums to gently exfoliate dead skin cells. Start with a custom cleanser for your skin type, next we’ll use the hydrodermabrasion machine to exfoliate and hydrate, then finish off with moisturizer and SPF. Spaces are limited and each client gets their own time slot. Sign-up for time slots are on a first come first serve bases. So arrive early to get your preferred time slot. Parking is available in the Veridian parking garage, and free for the first hour then $3 per hour after with validation. 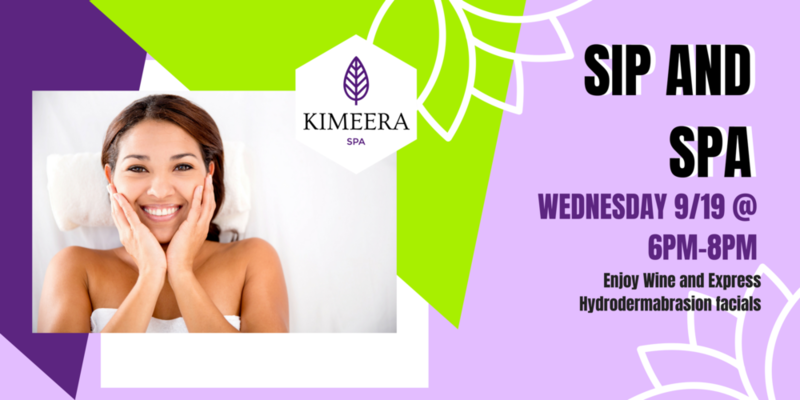 Kimeera Spa is located in Sola Salon studios in studio #22, down the hall to the left. Traffic in Silver Spring is HORRIBLE! Make sure you give yourself extra time and arrive early.